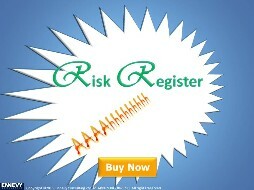 The Breach Register is a breach management tool and is an all purposes breach register. It has a companion booklet 'Breach Register, The booklet for the Breach Register released in November 2015'. The Breach Register is suitable for recording a wide range of breaches, and is capable for recording up to 9 different kinds of information to describe a breach. The Summary automatically updates the total breaches, and open and closed breaches with breach ratings based on the trafic lights. The Breach Register has two components: the Breach Register and the booklet. The systems required to operate it and read the companion booklet are Microsoft Office Home and Business 2010 Excel and Adobe Reader. By placing your Order you acknowledge that you are purchasing one licence for one quantity of the Breach Register Product for a period of 12 months for your sole use of the Product. The 12 months licence period commences from the date of the purchase. Any variation from the licence conditions requires confirmation in writing from Ennevy Consulting. To find compliance consulting, go to Compliance.